Measure around the widest part of your calf in millimetres, as shown in the diagram. Follow the chart row down until you reach the calf measurement that most closely matches your own. Follow the left column on the chart below to match up with your calf width size (this will either be curvy, super curvy and so on). 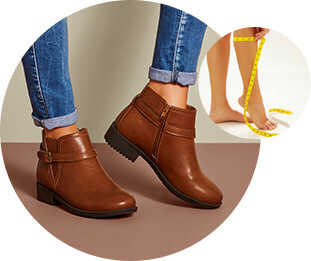 Once you have found your perfect fit, click the links below in your size to find your perfect boot! We have an unrivalled choice of boot styles available in curvy, super curvy, curvy plus and extra curvy plus calf fittings. And what's more our boots also come with a choice of foot widths too including standard, E, EEE and EEEEE fit boots. Use our handy guide to find your perfect fit.